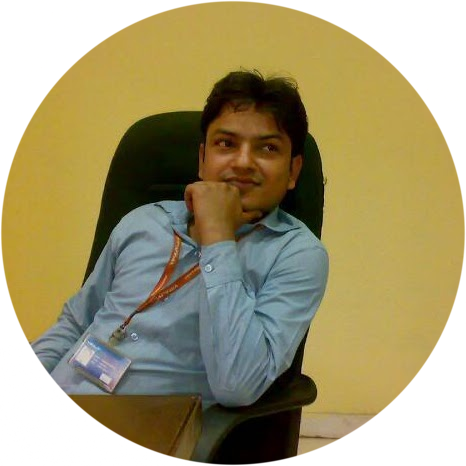 We were discussing the “derivation of relationship between young’s modulus of elasticity (E) and bulk modulus of elasticity (K)”, “Elongation of uniformly tapering rectangular rod” and also we have seen “Volumetric strain for a cylindrical rod” and “Volumetric strain of a rectangular body” with the help of previous posts. 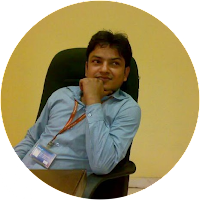 Now we are going further to start our discussion to understand the basic principle of complementary shear stresses with the help of this post. 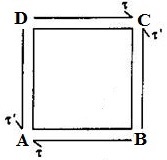 Let us consider a rectangular block ABCD as displayed in following figure. Let us assume that a set of shear stresses (τ) of opposite direction, as displayed in following figure, is applied over the opposite surfaces of rectangular block i.e. AB and CD. Now if we consider the effect of this set of shear stresses (τ) of opposite direction, we can easily say that there will be zero net force acting over the rectangular block but there will be one couple acting over the rectangular block in clockwise direction. In order to balance the rectangular block, there must be one more couple of similar intensity acting over the rectangular block in opposite direction i.e. in anti clockwise direction. Therefore, there will be one more set of shear stresses (τ’) of same intensity acting over the rest two opposite surfaces of rectangular block and this set of shear stresses will be termed as complementary shear stress. Let us consider that thickness of the rectangular block ABCD, normal to the plane of paper, is one or unity. We have already seen that applied set of shear stresses is τ and set of complementary shear stresses is τ’. Direction of force (τ x AB) acting on surface AB will be towards left. Direction of force (τ x CD) acting on surface CD will be towards right. As these two forces i.e. (τ x AB) and (τ x CD) are equal in magnitude and acting in opposite direction and therefore these two forces will develop one couple which will be acting in clockwise direction. In order to balance the rectangular block, couple developed by applied set of shear stresses (τ) and complementary set of shear stresses (τ’) must be equal. Therefore we can say from above equation that A set of shear stresses acting across a plane will always be accompanied by a set of balancing shear stresses of similar intensity across the plane and acting normal to it. Do you have any suggestions or any amendment required in this post? Please write in comment box. We will see another important topic i.e. Elongation of uniformly tapering circular rod, in the category of strength of material, in our next post.